As the Buffalo Bandits prepared for their 25th anniversary season, there was one obvious question that was hanging over the roster. Would John Tavares go 25 for 25 and put on a Bandits' uniform again? Everyone received an answer in early September, 2015. No, he wouldn't. Tavares announced his retirement from the game at a news conference. Tavares had been bothered by leg injuries in the final portion of his career, and had come close to retiring the year before. He left with almost all of the important records (goals, assists, points, etc.) in National Lacrosse League history. "I've developed a good rapport with the fans of Buffalo. Whether I was 22 or 42, I've given the game all my energy," Tavares said. He did supply one surprise at the news conference, as he took a job of assistant coach with the team. Dan Teat was leaving that spot, and Tavares was a natural fit if he wanted the job. It turned out that he did, so he'd be around the team in Year 25. The Bandits picked a 25th season all-time team, and Tavares was the obvious choice for that. The other selections were Mike Accursi, Kevin Alexander, Cory Bomberry, Troy Cordingley, Kyle Couling, Ross Cowie, Steve Dietrich, Brian Hall, Derek Keenan, Darris Kilgour, Rich Kilgour, Kyle Laverty, Pat McCready, Ken Montour, Andy Oglivie, Steve Priolo, Billy Dee Smith, Mark Steenhuis, Teat, Mike Thompson, Jim Veltman, Roger Vyse, Chris White and Shawn Williams. Later in the season, Buffalo picked a six-man all-time starting unit, consisting of Tavares, the Kilgours, Steenhuis, Smith, and Dietrich. With Tavares' situation settled, general manager Dietrich could start planning for the 2016 season in earnest. He needed a forward, and added a couple of possibilities by signing veteran Daryl Veltman as a free agent and drafting Anthony Malcom in the second round. Veltman was the nephew of former Bandit star Jim Veltman. One player who the surprise of training camp was fourth-round pick Tim Edwards, who may have been the best athlete on the team. Edwards stayed on the practice squad for the entire 2016, but the coaching staff believed he could turn into an important player down the road. Rookie Mitch de Snoo came over from Calgary in a trade for Brandon Goodwin; it was hoped that de Snoo could help compensate for the loss to free agency of Derek Suddons. For the most part, though, it was close to the same cast as the 2015 team. "This will be two years in a row that we stuck with mostly the same group," Dietrich said before the season. "If it doesn't get done this year, there will be changes made. Whether that's me or Troy, who knows? There's a lot of pressure. It's time to take the next step. There are no more excuses." We didn't know it at the time, but opening night turned out to be a good indicator of what sort of season it would be. With the score tied in the final minutes, Dhane Smith had the ball on the left side. He made a quick move to get past Tyson Bell (Smith's cousin, by the way) and scored with the game-winning goal with 70 seconds left. "The poor kid, he got undressed on the play," goalie Anthony Cosmo said. Smith finished with two goals and three assists, and he was off on an amazing season. The Bandits let one slip away a week later, giving up the final three goals in a 15-14 overtime loss to Colorado. But Buffalo rebounded with a convincing 12-6 home win over Toronto. Smith had nine points in a game that saw only three minor penalties called - a very low number for teams that usually play like bitter rivals. "I loved that discipline," coach Cordingley said. "That's been a work in progress. Tonight we just played. We were not worried about the refereeing or anything." A trip to New England was unsuccessful, but Buffalo returned the favor with a close 12-10 win at home - barely hanging on after taking an 11-10 lead. Clearly, the Black Wolves were not the doormat they had been the previous year. The home game was Champions' Night as the Bandits honored members of the four championship teams from the past. Some of them took part in a halftime alumni game. Buffalo's offense had its best game of the season on Feb. 14, blowing out the Swarm in Georgia (the team had moved from Minnesota), 21-14. Smith had 13 points, while Ryan Benesch had nine. But it was followed by a dud of a weekend - a loss in Toronto to the previously winless Rock, followed by a defeat the next night at the hands of Georgia. "It was nothing new," Malcom said about the Swarm's play. "They just capitalized, and we didn't." The game spoiled a milestone for Cosmo, who became the all-time league leader in saves by a goalie. The Bandits therefore were 4-4 as they approached the midpoint of the season, and were in the middle of a crowd in the NLL East. They had the difficult task of playing in Saskatchewan on Feb. 26; the Rush - the league's defending champion - had moved from Edmonton in the offseason. Buffalo hadn't been below .500 through eight games, but some sort of turnaround was needed. What happened next may have turned around their season. By this time, it was pretty obvious that Dhane Smith was on his way to a special season. He had 21 more points than anyone else in the league, and led the NLL in goals with 33 - eight ahead of the competition. 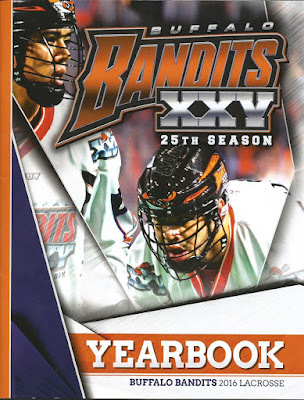 The Bandits followed that performance by overwhelming Vancouver right from the start in a 13-8 win, and returned home on March 11 to stop Rochester, 13-10. The win over the Knighthawks was slightly overshadowed for many by the ceremony marking the retirement of John Tavares' uniform number of 11. The game ended with the Bandits taking a victory lap, but - at the urging of the team - Tavares was at the head of the line to cap a great night for the franchise. "It was a little slippery out there in good shoes," Tavares said afterwards. "I didn't want to fall. I thought they might pull the rookie stunt where they send someone out there and then don't follow him. Here's one of the videos that was shown during the course of the night. Next up was Vancouver again, and the Bandits didn't have any problem thanks to Smith. The "Great Dhane," as he was being called by public-address announcer Chris Swenson, had six goals and six assists on 20 shots. That made him the first player in the league to reach 100 points for the season, and it was only March 25. It might have been his best game of the season. "It's up to him how good he can be," general manager Steve Dietrich said. "He could go down as an all-time great, the best player in the league. He doesn't have to go that much farther." The offense was still clicking a week later, as the Bandits scored 18 goals in a win at Georgia. It was a close game until Buffalo scored nine goals in the fourth quarter; Smith had three of them to finish with five. Then Buffalo went about the business of clinching a playoff spot - with four games left on the schedule - with an April 9 win over Rochester. Kevin Brownell scored the game-winning goal on a breakaway with 1:38 left. "I just sprung up the floor, and I made the decision to shoot it," Brownell said. The win made it six wins in a row. In that game, Cosmo broke Bob Watson's league record for minutes played. The Bandits' streak ended with a 12-9 loss in Toronto. Smith had 16 shots but was held to a goal and an assist. But he and the team rebounded a night later back in Buffalo with a 14-8 win. "What a huge difference 24 hours makes," said Cordingley, who wasn't happy about his team's play earlier in the weekend. On April 23, Buffalo made its only appearance of the season in Rochester, and put another nail in the coffin of the Knighthawks' playoff hopes. The Bandits came away with a 15-13 win, and Smith scored an empty-net goal with six seconds to go. That gave him 131 points for the season, breaking Shawn Evans' record set the year before. "I didn't even realize I had set the record until I got into the locker room and the guys told me," he said. "I'm glad I got it over with. There's not as much pressure on me now." That left one more game on the schedule, and it was an important one. Buffalo was a win away from wrapping up the NLL East and a first-round bye in the playoffs. A loss would give New England a chance to take the division crown by beating Rochester the next day. But the Bandits took care of business with a relatively easy 12-7 win over the Black Wolves. It was the team's 13th win of the regular season, breaking the team record, and ninth in its final 10 games. Dhane Smith scored four goals to bring his season total to 72, breaking the league record. In other words, mission accomplished. "It's another achievement, a goal that we set in the beginning of the year," Cordingley said. "The guys were real good. ... As the game progressed, we got into the flow and played the way we can play." Smith finished with 137 points for the season. Ryan Benesch had 39 goals and 92 points; Smith and Benesch combined for 111 goals, an NLL record by two teammates. Steenhuis had 34 goals. It had been a memorable regular season ... and the team needed to forget about it instantly as the playoffs arrived. New England beat Georgia to advance to the East final. Someone forgot to consider the possibility of a home playoff game at the Mohegan Sun Arena, because the building was booked for concerts on May 5, 6, and 7. The first-round playoff game was first announced for Tuesday, May 9, but that wasn't going to fly in a league filled with players and coaches with full-time jobs. The game was moved to May 8, which did cause some scrambling with work schedules but eventually had full participation. New England started the game in dominating fashion, scoring three goals in a little more than five minutes. But the Bandits handled the situation well, thanks in part of a major penalty on ex-teammate Suddons. Benesch and Alex Kedoh Hill scored on the power play, and Mitch Jones tallied to tie the game before 10 minutes were up. Buffalo slowly pulled away from there, as the Black Wolves never got closer than three goals in the 15-10 win. The series was "best-of-two" with a mini-game to decide things if the teams split the regulation games. Therefore, the Game One didn't mean a great deal. Buffalo still needed to win Game Two on May 21 in order to avoid the luck involved in a 10-minute deciding game. More than 14,000 fans turned out in the First Niagara Center, and what they saw was one of the most fierce, competitive contests involving the Bandits in recent memory. You want close? There were eight different ties before the end of the third quarter, when the score was tied at 13-13, including five straight sets of traded goals. But Malcom put Buffalo ahead late in the third quarter, and Culp added another score early in the fourth. The Culp goal felt like a huge one because it was the first time either team had a two-goal lead since New England was up, 9-7, in the second quarter. Benesch and ex-Bandit Kevin Buchanan had two goals each in the fourth quarter, but it was still a two-goal lead with three minutes left. Then Culp struck again with 1:53 left, and he could almost taste the first trip to the finals of his long career. Steenhuis and Hill added insurance, and the Bandits were on their way to their first final since 2008. There was one step left, and it was a big one. Saskatchewan defeated Calgary, and the Rush - who had won the league championship in 2015 while playing in Edmonton - had a chance to defend its title. It was a fascinating matchup. Buffalo was tops in goals, Saskatchewan was first in goals against. Both team had offensive stars and veteran goalies. The Bandits had the home-field advantage while the Rush had championship experience. No one could pick a winner from an objective viewpoint. Zack Greer added an insurance score, and the opening game was the Rush's by an 11-9 count. Smith finished with six points, but didn't get much help from his teammates. Saskatchewan did an excellent job of preventing transition goals, a Bandits' strong point throughout the season. That meant the Rush had a chance to win on its own floor, and all of Saskatoon was ready for it. This was the city's first professional franchise, and they had turned out in large numbers down the stretch. 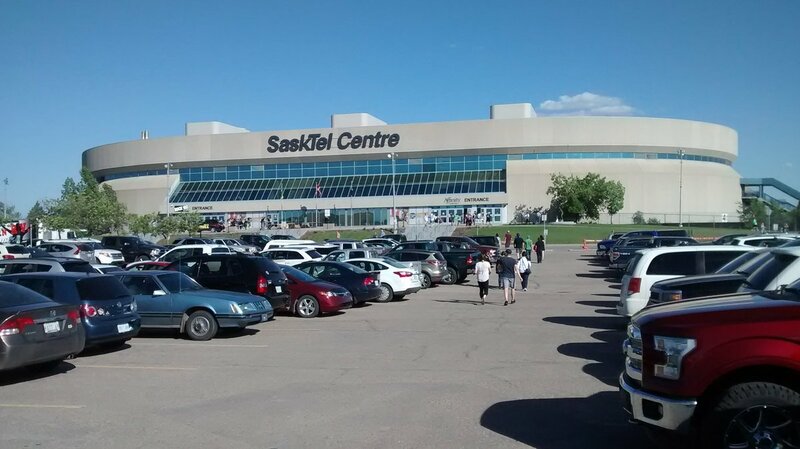 Saskatoon filled the SaskTel Centre for Game Two of the series - and not just because the arena doesn't charge for parking. Game Two may not have been as well-played as the opener, but it probably was even more exciting. The Rush scored two goals within the first two minutes, and the noise level was deafening. 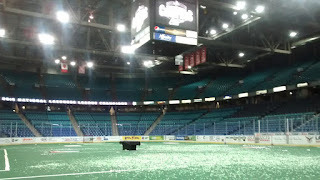 This was a key early test for the Bandits, who didn't want to home crowd to carry Saskatchewan on a wave from the start. Buffalo settled down nicely, and had a 4-3 lead by the time the period was over. In other words, game on. The game settled down to a slugfest in the second quarter. The Bandits did get more goals out of their transition players in the first half, but Smith was involved in most of the scoring for Buffalo. When the teams traded goals in the final minute, the teams left the floor at halftime at 5-5. The Bandits gained a little control with a pair of goals in the third period, but McIntosh and Greer scored on a pair of long-range shots that tied the game at 7-7. That could have demoralized Buffalo, but it scored the final two goals of the third quarter to make it a 9-7 game. The teams traded missed shots for a few minutes, but Mark Matthews scored a power-play goal that gave the Rush some life. Robert Church followed with two goals in 56 seconds to put Saskatchewan ahead, but Brownell answered with 4:24 left in regulation to tie the game at 10. As the saying goes, it felt like the last goal would win. “A big part of the play was that I wasn’t thinking,” Cornwall said. “It felt like something from practice. I usually have to focus on defense. When the opportunity came, my first thought was, don’t let the guy behind me catch me. Then I worried about putting the ball in. I had to complete the first task, and then move on to the second. The Bandits had time for one last shot, but not for a good last shot, and the Rush piled together behind the net in celebration while a spent Buffalo team watched from its bench. Eight years earlier, the Bandits won a title when Mike Thompson made a save in the final seconds. Now they knew how Portland felt. The Bandits had played the Rush almost dead even. But Saskatchewan shut down the Buffalo offense in the fourth quarter of both games. All the Bandits could do was to say the better team won. The remains of the Rush celebration were left behind after Game Two. It had been a terrific joyride of a season, filled with milestones and nice moments. But it wasn't a championship season. The fifth title in franchise history would have to wait.